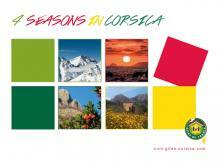 Looking for group accommodation for an off the beaten track holiday in Corsica? Gites Corsica has the perfect solution: why not rent a Corsica gite from among their wide choice of Corsican self catering accommodation? Perfect for both one-night stopovers and longer group stays, gîtes d’étape are strategically placed along cross-country mountain bike trails or long distance foot or bridle paths, and offer overnight Corsica self catering accommodation to cyclists, horse riders and walkers alike. Gites Corsica stopover gites can cater for parties of up to 35 people, making them ideal for anything from school trips to family get-togethers and parties of friends. Visitors can choose a Corsican rental for groups with confidence because all Gites Corsican self-catering accommodationis regularly inspected and classified. Each Corsica gite is awarded 1, 2 or 3 ears of corn, depending on the standard of accommodation and the facilities provided, in accordance with the clearly-defined criteria set out in our national charter. At their simplest, a Corsica gite for stopovers and group stays is equipped with communal living areas, and sleeping quarters in rooms or dormitories. Beds are comfortable and linen is sometimes provided. Sanitary facilities may be private shared. Different catering arrangements are also offered depending on the gîte d’étape you choose: from Corsica self catering accommodation with fully-equipped cooking facilities, to a catered Corsica gite where groups can enjoy the food provided by the gîte owner, which may include breakfasts, packed lunches or dinners.